If you’re into responsible tourism – and who isn’t these days? – check into ecolodges and green hotels in the Caribbean, Central and South America and even in the US, where families can have fun while learning about the environment. While it’s easy to maintain environmentally friendly practices at home, eco-conscious citizens usually find this task daunting when they’re on a family vacation. But now, with the booming ecotourism industry, remote ecolodges are popping up all over the world. Known simply as green hotels when they’re in urban settings, these newer or refurbished accommodations are so family-accommodating and earth-friendly that it doesn’t have to be Earth Day for you to consider one. The ecolodges I’ve investigated — a few in the Americas, mostly in rural settings, some even in the big cities — help guests understand their methods of sustainability, offer trips throughout the local region, and encourage guests to interact with the local community, oftentimes allowing families to have more of an authentic experience. 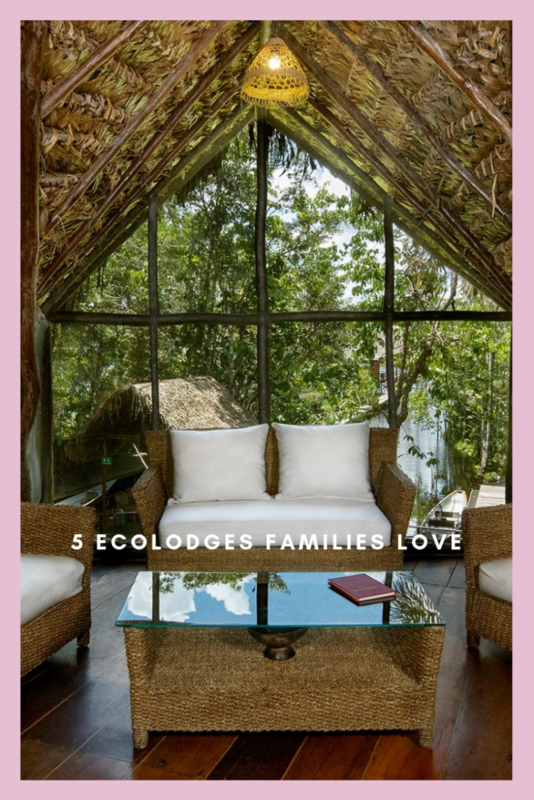 Take a look at a few of these ecolodges and environmentally responsible accommodations that offer families luxury and comfort in the most exciting places, while still pampering Mother Earth. Set between the rainforest and the beach, Lapa Rios preserves 1,000 acres of some of the last remaining lowland rainforest in Central America. Guests can take advantage of excursions into the jungle, like the rainforest ridge walk or the wild waterfalls tour, and water activities, such as surf lessons and ocean kayaking. Besides the jungle wildlife sightings, there are a few tours to spot marine life such as the sea turtle tour and the ‘Gulfo Dulce’ Dolphin tour. Family cooking demonstrations, wildlife walks and on-site talks with naturalists are included in rates. Lapa Rios encourages guests to become familiar with every aspect of the region through interaction with the local community. There is also a tour to a nearby farm, so guests can experience a typical rural farm and witness the local culture firsthand. All meals are prepared by locals, exposing guests to Costa Rican cuisine while still serving a few classics on the menu. There are weekly soccer games with Ticos (as Costa Ricans call themselves) and tours to the local school, where your little ones have the opportunity to play with kids from another country and culture. Also, families usually enjoy the volunteer rainforest at Lapa Rios, where guests are able to plant a tree and contribute to the reforestation efforts. The 6 o’clock coffee delivery each morning is just one way that Lapa Rios makes its guests feel at home. From the bare-foot friendly warm wooden floors to the private decks complete with hammocks, the thatch roofed bungalows at Lapa Rios offer extreme comfort for all guests. The bungalows come in singles, doubles, triples, and quads, with children at a discounted rate. Lapa Rios is connected to the Corcovado National Park and is closest to the Puerto Jimenez airport, but domestic flights to and from San Jose can be arranged by the staff. The bustling ecotourism industry in Grenada has shifted away from high-end luxury resorts toward more family-run and sustainable lodges, such as this one, the first Green Globe-certified resort on the southwest coast. Blue Horizons has 32 cottage-style accommodations that are self catering with solar powered heating, water saving facilities, and energy-saving air conditioners and light bulbs. Like most Caribbean resorts, beach time is encouraged and lounge chairs and scuba gear are available, along with other non-motorized watersports gear. There is also an on-site swimming pool and a small playground. It’s said that 27 species of birds live among beautiful tropical gardens on the 6.25 acre resort grounds. The restaurant, La Belle Creole, features gourmet meals with a West Indian influence in an elegant patio setting with nice sunset views. The biggest attractions are the tropical gardens and the famous Grand Anse Beach, both located within walking distance from the cottages. During the off-season, from May through December, inquire about Blue Horizons special family packages when kids stay free. Excursions, private tours of Grenada, and offshore expeditions can be arranged at the front desk. Blue Horizons is located just five miles from the Port Salines International Airport. Ever wanted to view the jungle from the angle of the tropical birds that get to fly over the tops of the trees? The canopy walkway, raised by three sturdy towers, puts Sacha Lodge guests 94-feet off the ground for bird’s eye view of the jungle. Along the 940-feet walkway, guests have an opportunity to see thousands of colorful birds and various species of animals in the jungle below. When tired from excursions into the jungle, or just in need of some down time, guests can visit the swimming pool or try their luck at piranha fishing. The lodge was built with sustainable materials on what is now a 5,000-acre property. Each of the 26 guest rooms takes the form of a log cabin with jungle views, best enjoyed from the hammocks on your balcony. Rooms sleep singles, doubles, or triples and there are other special rooms for families upon request. Children under 4 stay for free and children between 4-12 are given a 30% discount. Some excursions may be too difficult for little ones, but Sacha Lodge also has a butterfly house, guided tours via dug-out canoes, a meshed-in swimming area and local day tours. Getting to the lodge is an adventure; it is reached by a 25-minute flight over the Andes Mountains from Quito (Ecuador’s capital), then a covered, motorized canoe ride up the Napo River and across the Pilchicocha Lake. The journey, escorted by a bilingual guide, is all arranged for guests by Sacha staff and includes bathroom and snack breaks. Within the bustling city, families still have green options, such as this hotel just steps from the gates of Chinatown. The rooms are decorated with natural tones and all linens are specially made from recycled fabrics. The well-insulated walls not only block out any urban noise, but also aim to maintain room temperature, avoiding heating and air-conditioning energy use. Besides the chemical-free cleaning products and in-room recycling, the Orchard Garden is non-smoking, purchases carbon offsets, plants a tree for every TripAdvisor review, composts kitchen waste and uses organic products in its restaurant. The rooftop garden offers a tranquil view of San Francisco, especially views of the nightlife. Built to meet LEED (Leadership in Energy and Environmental Design) standards, the Orchard Garden was the 4th hotel in the United States to earn LEED certification. The hotel’s owners, the S.C. Huang family, felt the need to “go green” for personal reasons including losing three family members to cancer. By creating an establishment that has its roots in Singapore’s Orchard Road and is environmentally safe and sustainable, they extend their passion for a cleaner environment to guests. There are seven Inkaterra locations throughout Peru, each specializing in involving guests with the local community and environment, ensuring that each experience is authentic. At my favorite Machu Picchu location, guests not only visit the Ancient Lost City of the Incas, but are able to stay in one of 83 luxurious and intimate cottages among a cloud forest. Inkaterra caters to families by offering 14 excursions of different intensities, such as an adventurous hike through the Andes or exploring the beautiful varieties of orchids around the property. 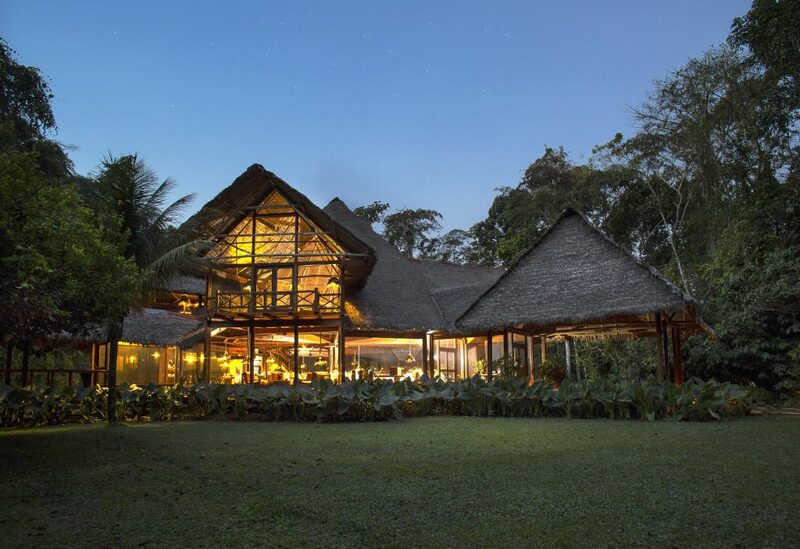 Besides being carbon neutral, Inkaterra has also preserved 30,000 acres of cloud forest. Interpretive tours through the cloud forest involve the enchanted waterfall, an ancient and sacred Peruvian site, an active tea plantation, and plenty of orchids and butterflies. After a long hike, the UNU Spa is a great place to unwind. Alternatively, villas boast a plunge pool that overlooks a lush landscape and jungle views. 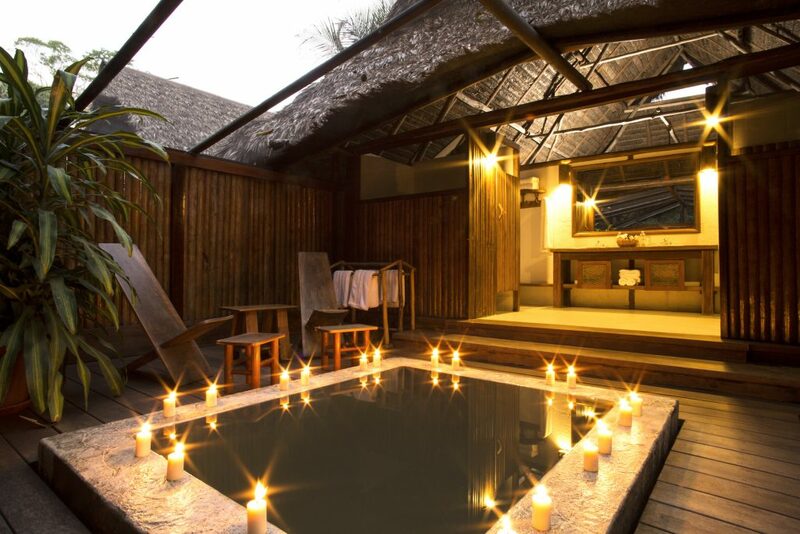 The two-room villas also have a private deck and garden along with VIP service: on-call butlers and private meals. The smaller casitas offer elegant bedrooms with fireplaces and spa-style bathrooms. Each room comes with genuine Alpacha wool blankets and is decorated with furniture designed by local artisans. For families, there are special cottages with connecting rooms, stocked with children’s menus, high chairs, and cribs. Through research done with the hotels’ NGO, according to their website, 814 bird species, 365 ant species, 313 butterfly species, 100 mammal species and 1266 vascular plant species have been registered within hotel grounds and surroundings. Inkaterra Machu Picchu Pueblo is easily reached by train just four hours from Cusco, but the trip by car offers more freedom to explore the various sacred sites along the way. Amazing hotels. I love eco-resort with nature style instead of modern hotels.